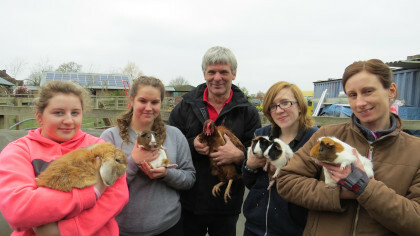 Emotional wellbeing sessions where primary school children work with rabbits, guinea pigs and chickens are more and more in demand. The sessions are run by Hurst-based charity Just Around the Corner (JAC), at their Forest Road site. JAC, celebrating its 21st anniversary year, runs many other projects to support young people. Funds raised by Hurst Show and Country Fayre last year are helping to pay for a £15,000 wooden building for the wellbeing sessions. Charity co-founder Yvonne Milligan said: "More and more Wokingham borough primary schools are referring children to our animal wellbeing sessions. "The children learn about the animals' needs and also their own needs and feelings. We see the children progressing in confidence and happiness as a result. We're pleased schools are using this help that we can provide. "At the moment the animal enclosures are scattered round the site. The new building will bring them together in one place. The children can then move easily from feeding the chickens and ducks, for instance, to looking after the rabbits." Hurst Show chair Sue Payne said: "We're delighted to support JAC's valuable work. They play an important part at the show, organising activities including pony rides and a bouncy castle. "We were pleased to raise more than £20,000 for good causes at 2018's show. We look forward to welcoming JAC again to our special 40th anniversary show on 29th and 30th June."